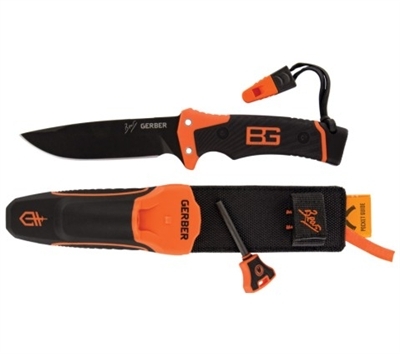 Gerber Bear Grylls Ultimate Pro Fixed Blade. 10″ overall. 4 3/4″ black coated 9Cr19MoV stainless drop point blade. Features striking plate on spine of blade for fire starting. Full tang. Orange composition handle with black TacHide inserts. Lashing/lanyard holes with emergency whistle and black nylon lanyard. Orange composition belt sheath with black rubberized inserts. An easily accessible carbide pull-through sharpener is integrated into the sheath with a pocket for storing survival guide. Also includes a 3″ overall Ferrocerium fire steel rod and “Priorities of Survival Pocket Guide”. Hang packaged.